The Year 9 camp takes place in early December and is a week in duration. In Year 9 students get the fantastic opportunity to explore the wilderness and history of Tasmania in the first interstate camp offered at Brentwood. 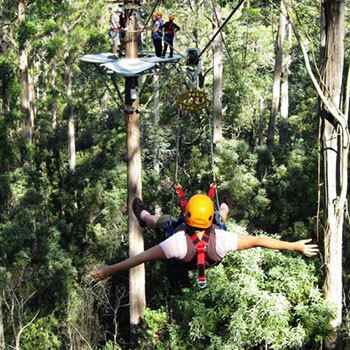 Students will travel to Tasmania via the Spirit of Tasmania ship and once there spend the first day gliding through the treetops on 10-15m flying foxes where students test out their courage and confidence in themselves. Day two takes students to Port Arthur Historic Site, a heritage listed penal settlement including a guided tour, river cruise and ghost tour for students to learn about the history of Tasmania as a penal settlement. The trip to Port Arthur is a powerful experience promoting self-awareness as students experience compassion and empathy whilst building upon their knowledge of history. On day three students will begin the morning with a visit to the famous Cadbury’s Chocolate Factory to tempt their taste buds and they will have some time to discover Hobart on their own. In the afternoon students have a guided tour of the living conditions in the Cascade Female Settlement where students will have an opportunity to reflect upon their own opportunities. Students will display curiosity and creativity when they experience the fun and hands on experiences that Zoodoo Wildlife Park has to offer on day four before heading to the airport and flying back to Melbourne. This camp is a wonderful experience that students have always thoroughly enjoyed.